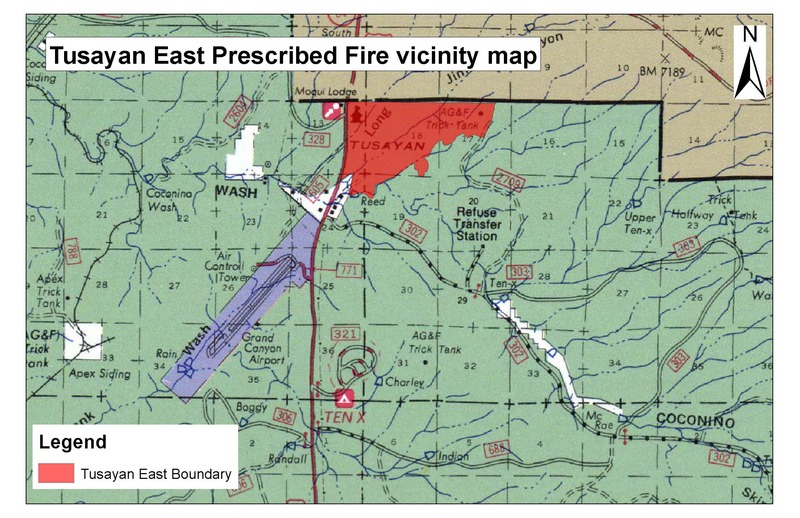 TUSAYAN— Crews plan to begin ignitions on a 264-acre burn on the Tusayan East Prescribed Fire Project on Sunday and intend to continue burning for approximately two days in the area if conditions remain favorable. 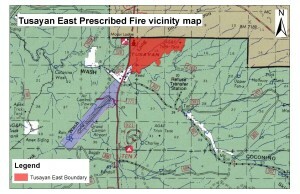 The burn area is located just south of Grand Canyon National Park and east of the town of Tusayan. Smoke may be visible from Highway 64 and in the communities of Valle and Tusayan. Light smoke may linger overnight and in the early morning hours. To minimize smoke impacts, fire managers will only conduct ignitions when conditions exist that will allow smoke to ventilate away from sensitive areas. Prescribed fires are essential tools for restoring the forests in a fire-adapted ecosystem, and smoke is an unavoidable byproduct of these efforts. Fire managers strive to minimize smoke impacts to the community as much as possible. Burns occur when winds and other atmospheric conditions will push the majority of smoke away from homes and ultimately limit the number of days smoke is in the air. Fire managers work closely with the Arizona Department of Environmental Quality, partners in the Grand Canyon National Park and surrounding Native American tribes to monitor air quality. 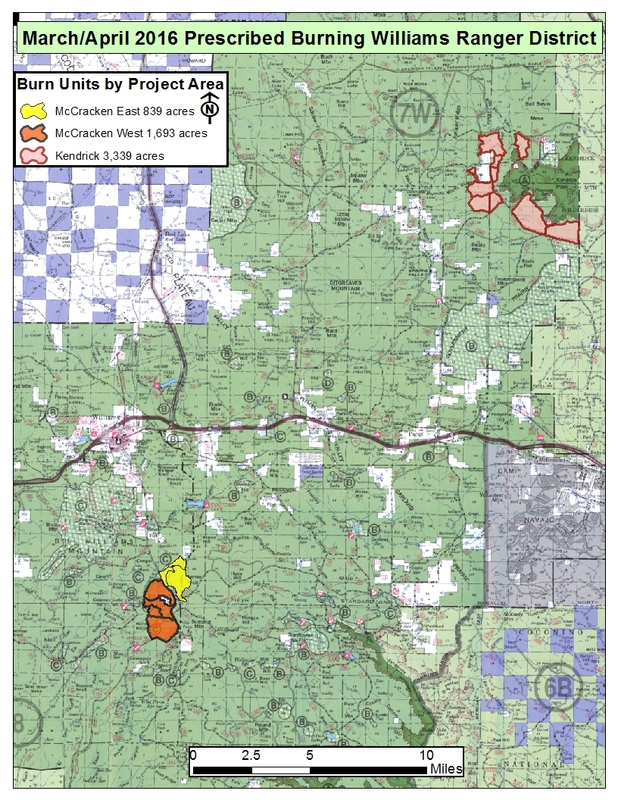 Fire managers for the Williams Ranger District of the Kaibab National Forest are planning to ignite prescribed fires at various locations across the district through the end of April. Operations may start as soon as Saturday. The specific prescribed fire units to be ignited will be chosen based on weather and fuel conditions. “Fuel moistures and weather conditions in the springtime are at prescriptive levels to meet objectives for fuels reduction projects,” James Pettit, fire management officer for the Williams Ranger District, said. During prescribed fire operations, community members and visitors may see fire personnel and vehicles in the vicinity. Smoke may also be present and may result in short-duration impacts to populated areas. 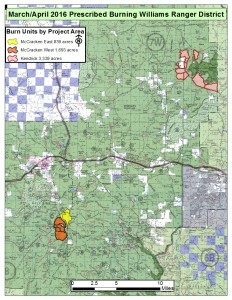 All prescribed burning on the Kaibab National Forest is subject to approval by the Arizona Department of Environmental Quality and appropriate weather conditions. For additional information on the Smoke Management Division of the ADEQ and to view prescribed burns authorized on any given day, please visit the ADEQ website.